The Delhi metropolitan area has one of the highest concentrations of population in the world, and suffocating the people of the area on an annual basis should be treated as a crime against humanity, especially when the cause for such suffocation can be controlled, says Arvind Kumar. Until a few years ago, when farmers in Punjab burnt the remnants of the rice crops in their fields in preparation for sowing wheat, the smoke from such fires was confined to Punjab. Clearly, farmers burnt the straw in late September and early October. However, in recent years, farmers have delayed the burning until late October. This delay is crucial and responsible for the smoke being carried all the way to Delhi. An analysis of the wind flow patterns (external link) reveals that wind blows into Delhi primarily from the west during the monsoon season, but changes direction in October and starts blowing into Delhi from the north. The decision to delay the clearing of the fields was not the choice of farmers, but was forced on them by the Punjab government which passed the Punjab Preservation of Subsoil Water Act (external link) in 2009. According to this law, farmers could no longer sow rice in April, but had to wait until the middle of June. Rice has a 120-day period between germination and harvest, and the restriction on sowing means that the fields would be harvested and cleared only in October by which time the direction of wind would have changed. Delhi's problem of being covered by smoke started right after this law was implemented. 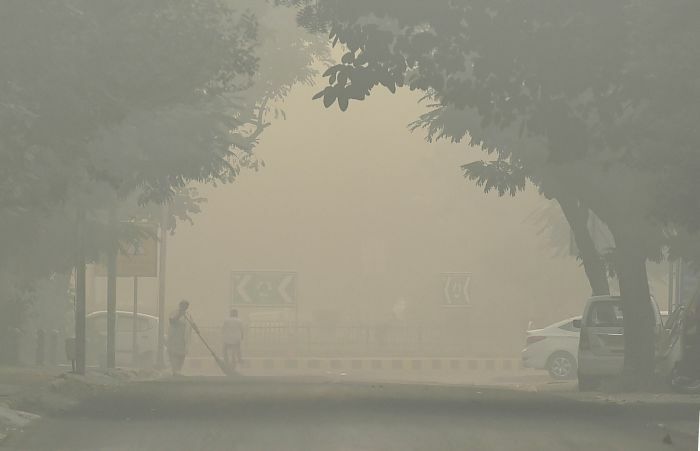 Before this law was passed, the problem in Delhi was limited to vehicular and industrial pollution and there were no reports of the entire metropolitan area being enveloped by smoke. This piece of legislation was passed ostensibly to preserve groundwater, the depletion of which was blamed on rice fields which supposedly used too much water and which were prone to evaporation, but this argument is a very tenuous one. According to the International Water Management Institute, water in rice fields contributes to recharging the groundwater (external link) and very little of it is lost to evaporation. The data from Uttar Pradesh in IWMI's report too shows that rice fields in the state contributed to increasing the level of the water table, thus supporting the claim that water in rice fields replenishes the aquifers. The group that has been primarily responsible for exerting pressure to move away from growing rice in the name of 'crop diversification' is the United States Agency for International Development. Over a period of several years, it has used the excuse of preventing the decline of groundwater (external link) to push this agenda. USAID has a worldwide reputation of behaving like a front group for American multinational corporations such as Monsanto, and so it should come as no surprise that Monsanto is at the forefront of the purported solution for Punjab's problems. Apparently, if farmers stop growing rice and replace it with Monsanto's GMO maize, the problem will be solved. India's surplus food grain supply is an uncomfortable fact for Monsanto and other proponents of GMO food who insist that the world would face a shortage of food grains if not for genetically engineered plants sold by Monsanto. It is in this light that one must view Monsanto's collusion with the Punjab government and their joint efforts targeting the production of rice in India. In 2012, then Punjab chief minister Parkash Singh Badal asked Monsanto to set up a research centre for creating maize seeds and announced plans (external link) to reduce the area under the cultivation of rice by around 45 percent in order to grow maize. Monsanto typically co-opts not only politicians but also members of the academia and converts them into its shills. Monsanto now offers the replacement of rice by its GMO crops as a solution that will increase the level of subsoil water, but the multinational corporation is the cause of the problem. Its fertilisers and pesticides have accumulated in the ground over the years and this has led to poor retention of moisture in the soil, (external link) leading farmers to pump excessive amounts of underground water. The new law reducing the time period during which farmers are permitted to grow rice has further accentuated this problem. Farmers had developed their own method of crop diversification by growing multiple varieties of rice and staggering the time of sowing these varieties over a period of two months beginning in April. The loss of the ability of farmers to easily diversify their rice crop combined with the fact that late sown rice is vulnerable to diseases and pests has created a fear in farmers of losing their crop leading them to use greater amounts of pesticides and fertilisers further degrading the soil and its ability to retain water. Monsanto's GMO products are known to cause several problems. Its maize is known for killing bees (external link) leading to a shortage of seeds of plants such as onions which depend on bees for pollination. Several European countries have banned its maize as its pollen has been responsible for killing entire colonies of bees. Monsanto's GMO maize is also not fit for human consumption and is primarily used as chicken feed. Likewise, most of Monsanto's wheat is used to feed animals because it is unfit for human consumption. Thus the government's plan to replace the cultivation of rice -- which is the staple food for a large section of the population of India -- by Monsanto's chicken feed is a cynical move that will result in government created food shortages in the country. The problems related to the low levels of groundwater and the inability of the soil to retain moisture must be solved, but the solution should not be a drastic one such as creating famines by banning food items such as rice. Before the level of groundwater fell in Punjab, the state experienced a problem of water-logging which was partially solved by pumping out the excess groundwater. Thus, it is clear that an acceptable level of the water table can be maintained by finding a proper balance between the two extreme situations. Today, farmers burn the residual straw from the cultivation of rice as it is the cheapest method of clearing the fields. A ban on such burning will destroy the livelihood of small farmers and give way to industrial farming with a few large corporations such as Monsanto owning all the land and resources. The government has already helped large corporations through a slew of measures and it must not take any more steps that run the small farmers out of business. Instead, if it wants to prevent burning, it must help small farmers clear the fields between the rice and wheat seasons and implement proper water management solutions. This would mean going against the rules set forth by the World Trade Organisation which has mandated that no business other than American multinational corporations can receive aid or subsidies from the government, and any subsidy given to American businesses will be done under the cover of 'research grants' funnelled through universities. India should completely ignore these rules and fix its problems, not the least of which is the yearly phenomenon of smoke cover over Delhi. The Delhi metropolitan area has one of the highest concentrations of population in the world, and suffocating the people of the area on an annual basis should be treated as a crime against humanity, especially when the cause for such suffocation can be controlled. Although smoke from fields remaining within Punjab is also a problem that needs to be dealt with, it is not as severe a problem as in Delhi, as the smoke in Punjab would be spread over a larger area with a much lower population density. For now, a step that should be taken immediately in order to prevent Delhi from becoming a gas chamber for several days every November, is to revoke what should rightfully be called the Monsanto Profit Act of 2009 and farmers should be allowed to sow their rice crop whenever they deem it fit to do so. Is only Delhi's air polluted? Does anyone care what air Delhi breathes?